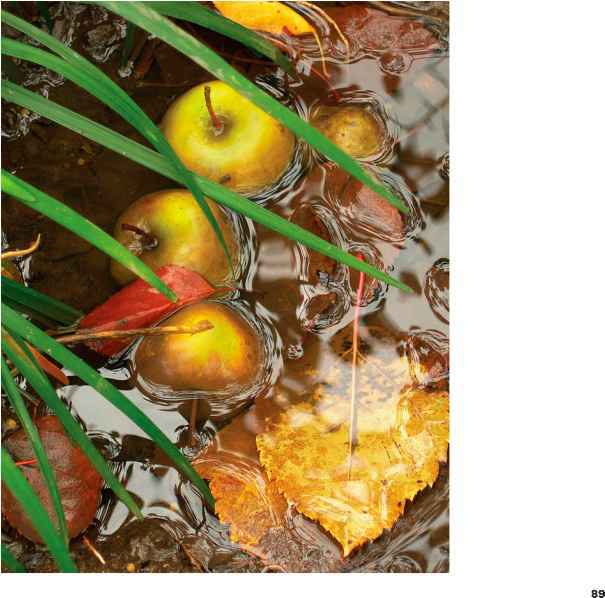 Photographer Nancy Balluck calls this a "lucky fluke," but looking at how everything pulls together in her picture "Green Apples," I'm forced to think of golfer Gary Player's observation, "The harder I work, the luckier I get." The photo breaks a couple rules—those green fronds growing from somewhere "off-screen" to the left are technically "mergers"—but there are enough positives, including the shimmering reflections off the water and rich glow of autumn colors, to make this image a real winner. "This shot was a lucky fluke, which doesn't happen very often," Balluck says modestly. "I was taking a digital color photography class and one of our assignments was to use our white balance settings in various weather conditions. The only weather condition I had not yet shot was a cloudy, overcast day." She was at work and had only a tiny Nikon Coolpix 7900 point-and-shoot camera with her. "A thunderstorm had just passed through and the clouds still hung heavy so I grabbed my little Nikon and ran outside to shoot under cloudy conditions. After taking a few uninspiring shots I turned to walk back into the building and noticed a lot of rotting green apples submerged in watery muck underneath the apple tree. I didn't want to use my flash and didn't have my tripod with me so I gambled by taking a lot of shots, hoping that maybe one would come out without being blurry. I got lucky." The photographer's camera was set on "automatic everything, except for the white balance" which she had adjusted to the Cloudy setting. At the low sensitivity setting of ISO 50, the exposure was 1/18th second at f/4.9 (which is the smallest f/stop available with the modest f/2.8-4.9 38-114mm [equivalent] 3X zoom on the Coolpix). "I'm surprised that this photo came out so sharp!" Balluck marvels, noting that the camera has no image stabilization— only a post-shot Blur Warning. "In Photoshop I had to do some minor cloning on top of the apples because there were some hot spots and I had to clone out some weird things in the murky water. I also adjusted the contrast a bit and increased the saturation until this photo had the impact that I wanted."